Typically, the words “Hawaii” and “cheap” are not often found being used together. Often, when we decide to move to new cities or towns or even countries, it is not without hefty expenses. When Clay and I moved to Kailua, HI and began settling into our new home, doing it on the cheap was undoubtedly our goal. 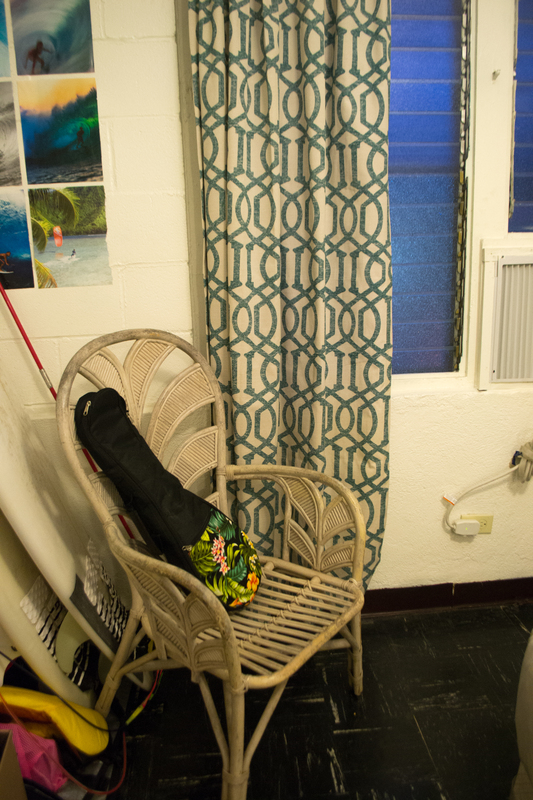 By being patient in finding and acquiring pieces of furniture – even a bed – we managed to furnish our surf-shack-studio apartment for a net $0 cost! Our luck in setting up shop on the cheap is attributed to patience, generous new friends, and a well-off neighborhood down the street. Here’s how you can do it, too. Our studio apartment looking bleak in its early days! Craigslist has its duds, but with its duds come its gems. Once we moved into our studio, we spent a few nights camping on sleeping pads in our sleeping bags looking for the right furniture – at the right price. After regularly searching the list, we stumbled upon a bed for sale for a grand total of $25. In a matter of a few hours, it was ours! Craigslist later came in handy when we needed rid of a piece of furniture we had obtained for free. I had never done much “flipping” before, but after a couple of days and a few emails of interest, I was officially a successful “flipper”. It may not be at every new work place that you find yourself with new insta-best-friends, but we were lucky for that to be the case at Kailua Beach Adventures! With our coworkers and new friends accustomed to the needs of Hawaii transplants, they graciously offered us any old furniture that they had been waiting to take to Salvation Army and hadn’t yet had the chance to. My friend, Laura, offered us a desk, two tables, and a lamp that her roommate had left when she moved away from the island. With a little luck in timing, we quickly had half the furniture we needed! When moving to a new place, don’t hesitate to ask new friends if they have anything they’re getting rid of – chances are, they do! 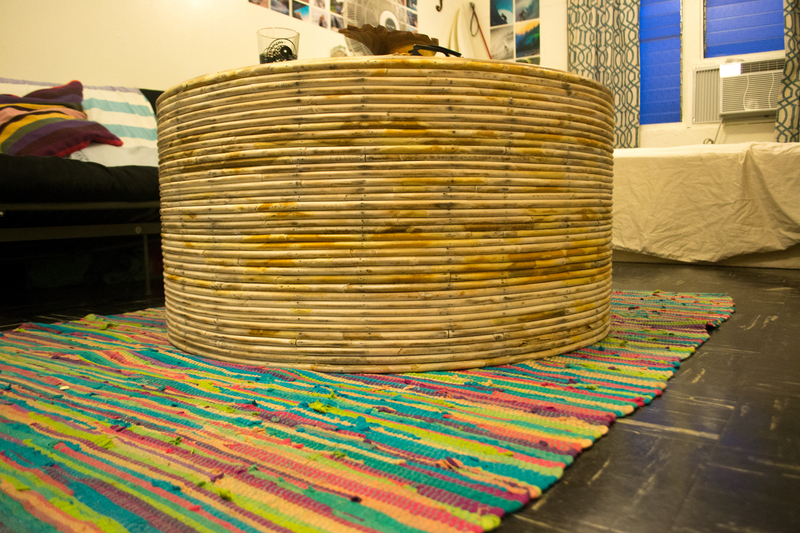 Our new coffee table found via street-shopping, pictured with a rug on-loan from our friend and co-worker, Laura, and a futon donated to us by our friend and co-worker, Marty. Street shopping? Yes, street shopping! The saying, “One man’s trash is another man’s treasure” could not be more true for us. With the well-to-do neighborhoods surrounding us, we quickly found two wicker chairs and the perfect beachy dining/coffee table situated in front of a house that was no longer wanted. Another street-find and we have a new chair! Patience is key as we didn’t have all of our furniture at the time that we wanted it. 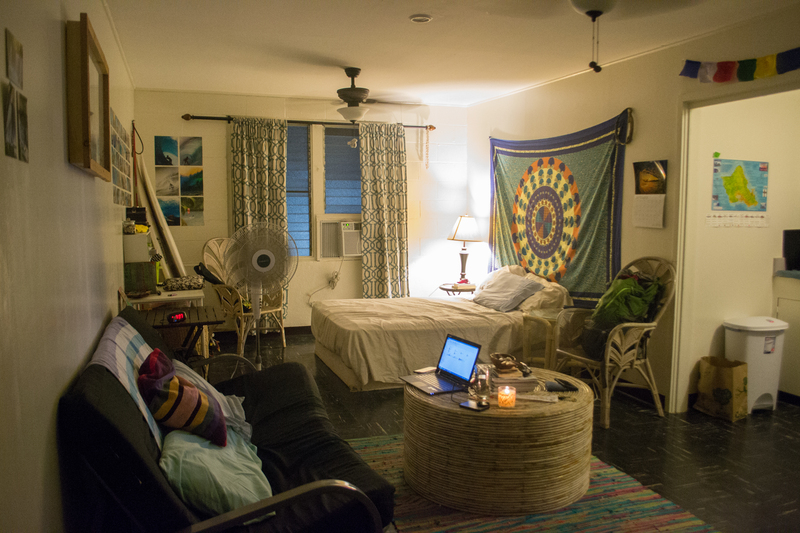 It took a few nights of eating dinner on a sarong on the bare floor and staring at blank walls before I had our new surf-shack looking and feeling like home! 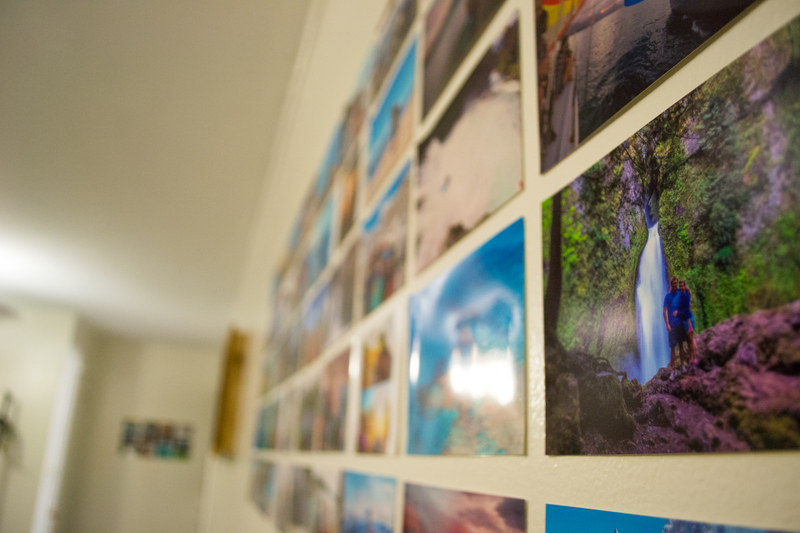 For cheap and easy wall décor, we made photo prints of our favorite photos taken around the world. At about ten cents a pop, you can’t go wrong! Tapestries are great wall-décor, and being light fabric they pack easily and can fit in your suitcase. 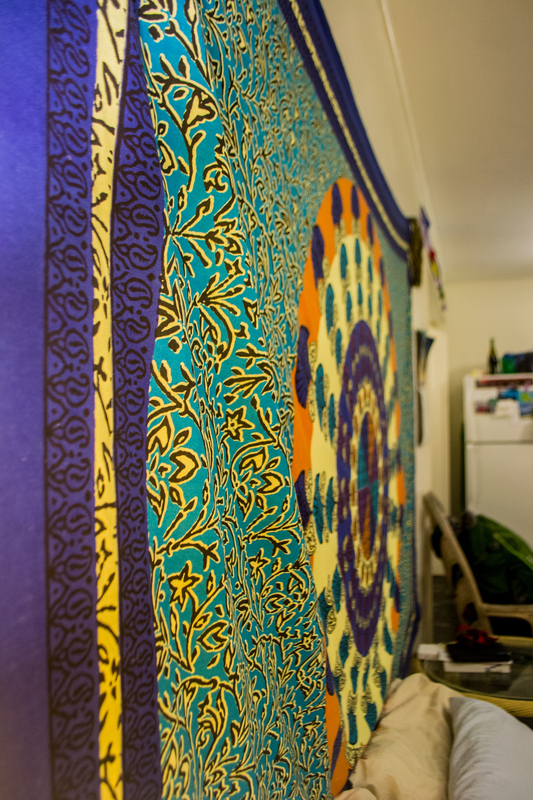 In this case, Clay’s tapestry that I picked up for him in Nepal made the move with us! Our beloved Nepalese tapestry made the move! Patience pays off! After a couple of months in the new place, we upgraded from a twin bed in this space to a futon. 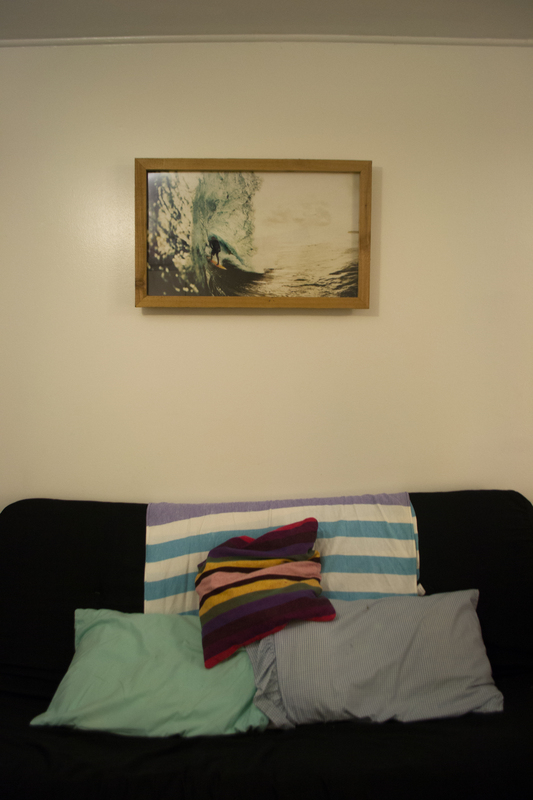 The surfer artwork came from the dumpster at work when Reef re-did their retail wall and replaced this photo and frame. Home sweet home, for now! Next Next post: Secrets to the Best Road Trip Yet!